There are tons of medical insurance plans to choose from in Malaysia. It can get pretty overwhelming, confusing and complicated at times because everyone is offering so many different variations of the same things. 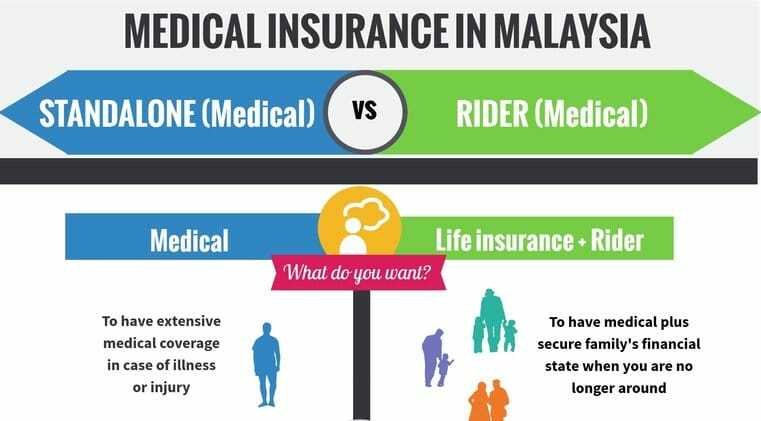 This article aims to shed some light on the differences between a standalone and a rider medical insurance — which most of us Malaysians have. If you are not sure of how to look for the right medical insurance, this Infographic may give you an idea. What Is A Standalone Medical Insurance? While there are many types of medical insurance, there are three types of cover that can make up a standalone health insurance. This really means charges and fees for hospital related services and supplies such as room and board, surgery, operating theater, ambulance fee and consultations. A critical illness cover can be for someone who could be diagnosed with life-threatening illnesses such as angioplasty, stroke, or cancer. Treatments for such illnesses are usually expensive. Here is a list of critical illnesses that insurance companies in Malaysia offer. This is usually beneficial for someone who has a chronic illness that took away his or her ability to take care of themselves. The benefits are like home care, live-in caregiver, housekeeper, hospice care or a private duty nurse. Most insurance companies in Malaysia offer the three individually or combined. Either way, you will receive a medical card which you can use when you’re admitted to the hospital. It can also be used for clinic visits or a check-up with your doctor at the hospital. When you’re short or out of cash, you can use the medical card without burning a hole in your wallet. A standalone policy covers benefits such as room and board, unlimited lifetime limits, kidney, cancer treatments, surgical and operational fees. While some insurance companies offer coverage such as nutritional allowance, compassionate care allowance and much more. Most standalone policies provide a guarantee that your policy will be renewed even though you’ve been diagnosed with an illness before your next renewal date. This is good to have. Here’s the reason why. Say if you were diagnosed with diabetes this year, and your policy is not a guaranteed renewal policy, the company has every right to reject your renewal. Now, you’re left with zero coverage for next year. Adding to that, other insurance companies won’t accept your application either, because now you have diabetes and it’s a risk they are usually not willing to take. If you are not sure, read your policy’s fine print or speak to your agent. Your agent can help you interpret the terms and condition. If you don’t have an agent, use iBanding to find and connect with an agent to help you. Here’s the tricky bit. Even though your policy may be guaranteed for renewal the following year, it doesn’t mean your premium is guaranteed or fixed. Your premium could change the following year. If you’re wondering why there are two factors that can affect a premium increase — age and medical inflation rate. Insurance companies usually provide a schedule showing different amounts according to age group. So the older you are, the higher your annual premium gets. According to Aon’s 2016 Global Medical Trend Rates Report, Asia’s average medical inflation is at 9.4%. And Malaysia’s medical inflation rate is at 14%. Typically, insurance companies revise premiums every 2 to 3 years. What Is A Rider In Life Insurance? Ideally, a life insurance is for someone who’s looking to help their family members financially when they’re no longer around. It’s never pleasant to think of the worse. However, it’s good to check it off your list – live a peaceful life without having to worry about your family. Think of the rider as the meal add-on to your plane ticket. In that sense, you can’t really purchase the meal unless if you fly with the airline that you bought the air ticket from. A rider can be a critical illness cover where on top of your investment-linked policy, it provides additional coverage when you’re diagnosed with life-threatening illnesses such as encephalitis, stroke, angioplasty or cancer. When you have investment-linked plus critical illness as a rider, premiums will be channeled in two portions, one being the premium paid to your investment fund and the other to pay for your critical illness policy. Typically, when you compare a rider and a standalone premium, you might find that a rider is cheaper than a standalone. But it’s only cheaper because it’s packaged together with life insurance. With a standalone policy, its benefits are far more comprehensive compared to a rider — even though a standalone premium can seem higher, the coverage you get could be worth your money. Then again, it’s always wise to ask yourself what you truly need. Some people are fine just opting for a standalone because they only need medical cover. But if you’re leaning towards getting coverage to secure your family’s future and need a medical cover for yourself at the same time, a life insurance plus a rider, could be ideal. Are you finding it hard to decide between a standalone health insurance and a life insurance that includes a rider? Share with us your experiences.